The recent post about the Solar Decathlon contest piqued my curiosity about initiatives related to sustainable building. In the public/private field we have, of course, the DOE, with its Building America partnership. It works with home builders in projects around the country that strive to implement energy-efficient solutions and technologies. It is hard to get into what private companies are doing, the list would be so long…. just today I was reading about the project SunEdison is providing for Kohl´s department stores. More that 75% of Kohl´s locations in California will be converted to solar power. Other companies provide services related to Green Building, to achieve the most energy efficient designs. An example in Miami is PGI Group, a firm that has been awarded with the “2006 M.E.P. Engineering Firm of the Year” by the South Florida Latin Builders Association. Its mother company in Spain, has worked in projects like the largest European photovoltaic system for a commercial building, at the Telefonica “District C” complex (16,000 solar panels) in Madrid. In the non-profit area, Habitat for Humanity has been building safe, affordable and sustainable homes for many people around the world, with the concern of sustainable construction practices and environmental responsibility in mind. They dedicated their first “green home” in 1997. The new houses are built as tight as possible — well-insulated and well-ventilated, well-caulked and very well-sealed, with the goal of achieving “net zero energy” homes. GreenBiz.com is reporting an interesting article about the environmental benefits of nanotechnology. In a recent report, researchers and environmentalists from the Project on Emerging Nanotechnology listed the four possible ways in which nanotechnology can have a positive impact on the environment. Substituting green nanotechnology products for existing products that are less environmentally friendly. According to the report, the United States seems to be emerging as the number one country for nanotechnology research. Combine this with the United States’ recent significant commitment to environmentally friendly energy policies and you have a formula for producing environmentally friendly nanotechnology, especially if that nanotechnology can somehow assists in producing green energy and ease dependence on foreign energy sources. For example, Nanotechnology may prove to be a method by which to reduce the amount of resources necessary in producing solar power panels.”>Overall, it seems that the report wants to emphasis that green nanotechnology is not a “niche” among scientists and environmental researchers, but rather a “commercially viable” option for businesses and governments. Finally, it is good to see that the report highlights the positive aspects of nanotechnology outside of medicine (e.g. nanotechnology being used to combat cancerous cells). It seems that sometimes people are uneasy about nanotechnology because either they find the technology unfathomable or they feel threaten due to the size of nanodevices. Yet, the report argues, rightly, that nanotechnology, like all technology, depending on who is behind the technology, can be a means to improving the lives of people. 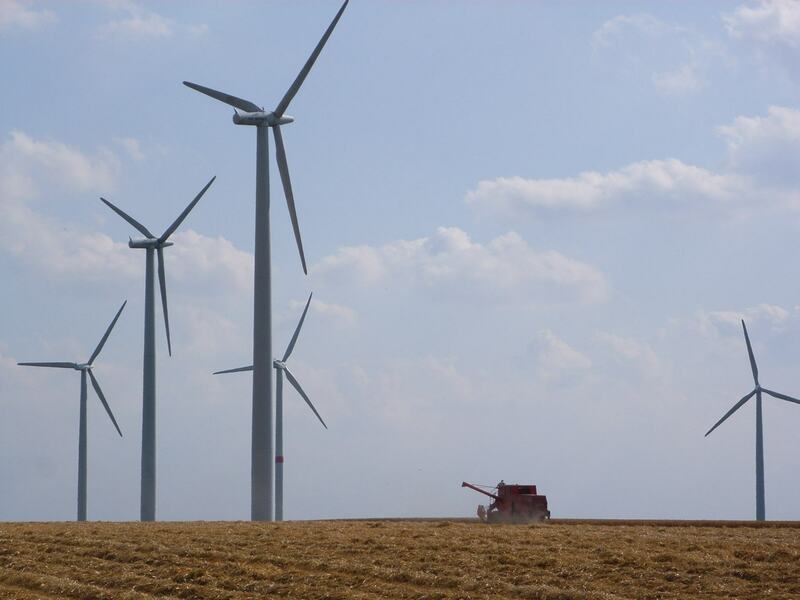 Many weeks ago, we reported (link here) that Acciona Energy North America, the American subsidiary of Pamplona-based Acciona Energia, had narrowed down its choice of location for its proposed wind turbine plant in the United States to two states: Illinois and Iowa. Today, Acciona announced that it has chosen West Branch, Iowa as the site of its new wind turbine assembly plant. This will be the Spanish company’s first such assembly plant in the United States and its fourth plant worldwide, with two in Spain and a third in China. According to the West Branch Times, West Branch has been waiting on “pins and needles” for news ever since Acciona announced that it was considering West Branch for its plant site in February. Iowa Governor Chet Culver and the West Branch are no doubt ecstatic over Acciona’s decision. Acciona will invest 17 million euros and will produce 250 turbines in 2008, although this figure is expected to rise in the following years. The assembly plant will produce 1.5 MW turbines and 3MW turbines, these latter turbines are in advance stages of development, according to Acciona. The new plant, which will cover an over of 100,000 square feet, will create 100 new jobs for the West Branch community. Moreover, Acciona is already constructing a U.S. network by which to supply the plant with equipment. While this is great news for members of the West Branch community, it is important to realize just how positive this is for both the United States and Spain. This is exactly the type of “technological dialogue” that we here at Technology4Life seek to highlight; a dialogue that enables nations and private companies to cooperate and proceed with innovations that either through job creation or through cleaner energy production aim to achieve one thing: to make life a little better for everyone. For some days in October, the National Mall in Washington, D.C. will become a “solar village” with teams from different colleges and universities around the globe, participating in an unparalleled competition, the Solar Decathlon, to design, build, and operate the most attractive and energy-efficient solar-powered home. All 20 teams selected to participate in the event present cutting-edge technologies and compete in 10 different categories to determine the winner. These 10 categories are: Architecture, Engineering, Market Viability, Communications, Comfort Zone, Appliances, Hot Water, Lighting, Energy Balance and Getting Around. In 2005, as in 2002, the University of Colorado team took home the top trophy by achieving the highest combined score for all ten Solar Decathlon contests. Second-place Cornell, third-place Cal Poly, and fourth-place Virginia Tech each won two individual contests in 2005. As the only European participant in 2005, with a house dubbed the “Magic Box“, the Spanish team from the Universidad Politécnica de Madrid (U.P.M.) has again been chosen to participate in this year´s edition. “Magic Box“ overall final place in the competition was ninth, but many aspects it included were well liked (e.g. it won third place in the Lighting contest), so it has also been selected by the Chinese government to be showcased in the Beijing Future House Demo Park to open in June. Because of its characteristic shape and color, “White wing” is the name given to this year´s UPM project. A key factor to consider is that the homegrown technologies that it incorporates are market-ready for commercialisation. * Installed capacity in megawatts, as of Dec. 31. The Des Moines Register offers these two lists which are good to see side by side, even though the units used in the rankings are different. As someone who has lived for some months in North Dakota, I can attest to the wind potential of the state. The most glaring gap between the two lists is how California is ahead in capacity, well beyond its potential, compared to Midwestern and Mountain states. Something similar happens with solar energy around the world. Japan and Germany are some of the leaders in installed capacity but are not the places with more potential in insolation per hour. This tells us that a determined policy and a stable framework where actors can operate is the key to sustained growth. Generally, when people hear the words “military power” they picture tanks, aircraft carriers, and fighter-jets–big gas-guzzling machines that generally blow things to smithereens. So, it is no wonder that “military power”, much less“U.S. military power”, fails to conjure up notions associated with green energy. Yet, soon enough, the largest solar power plant on the North American continent will be built to provide electricity to Nellis Air Force base, situated just outside of Las Vegas. The 140-acre solar plant will be capable of producing 15 megawatts of power, enough to provide Nellis, where 12,000 people work daily and 7,215 live, with 30% of its power needs. From USA Today: “It allows the Air Force to show its leadership in applying renewable energy and new technology to reduce our needs to use traditional forms of electric power,” says Maj. Don Ohlemacher, operations flight chief and acting commander of the 99th Civil Engineer Squadron at the base. Aside from the obvious environmental benefits of utilizing solar energy, the U.S. Air Force estimates to save approximately one million dollars in lower energy costs. The savings, however, comes only after millions of dollars worth of incentives subsidiaries by both State and Federal government which allows the U.S. Air Force and its construction partners to build the plant and offer energy at a lower cost than the status quo. However, it is important to note the major obstacles that are still found in solar energy. These obstacles are far from fatal and can be overcome with further technological innovation and by support from State and Federal incentives. Moreover, it is important to understand that solar energy is only one part of the ‘green’ solution to energy production. The benefit of solar energy is best actualized not when it is the sole source of energy for a particular entity, but rather, when it is a part of a consortium of different green technologies producing energy. Source and full article at USA Today. According to a survey conducted by SustainLane.us, the number one city in the United States for renewable energy is Oakland, California with 17% of its energy coming from renewable sources. Second place was a three-way tie between San Francisco, San Jose and Sacramento with 12% of their energy coming from renewable sources. In fact, six of the top ten greenest cities in the United States were in California. San Diego came in 5th with 8% of its energy deriving from green sources and Los Angeles came in 7th with 5%. According to SustainLane the reason for the strong showing of Californian cities is due to the California’s Renewable Portfolio Standard that requires the state’s utilities to derive 20% of its energy from renewable sources. Chicago came in tenth place with 2.5%. Chicago, using its own renewable portfolio standard, aims to have 20% of its energy come from renewable sources by 2010. You are currently browsing the Technology For Life weblog archives for April 2007.